Add a new locomotive to the list. Delete the selected locomotives. With the Undo dialog it can be retrieved in the same session. 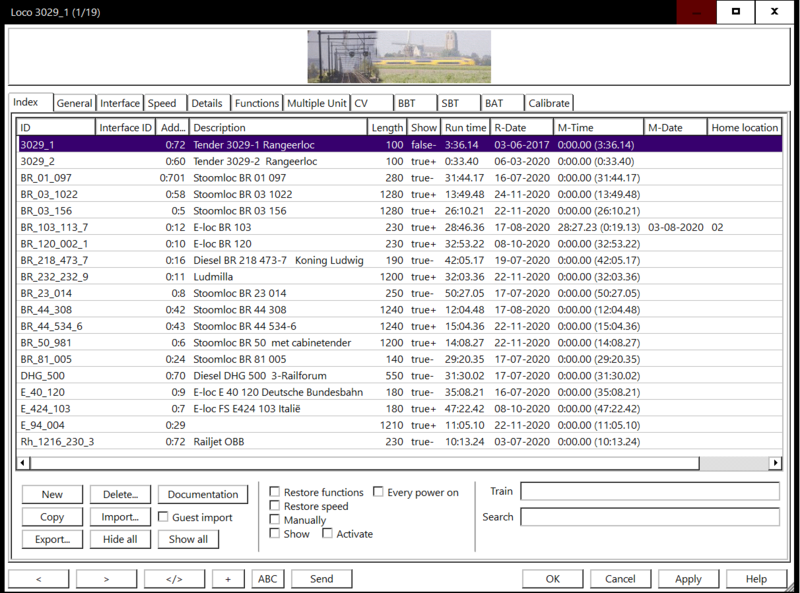 Opens the default HTML browser to show a listing of all locomotives for printing. Make a copy of the selected locomotive. The original ID is extended with "(copy)". Import all or the selected locomotives from another layout file. Advice: Disable the LocoWidgets before importing to speed up the processing. Import locos as guest which will be removed at shutdown. 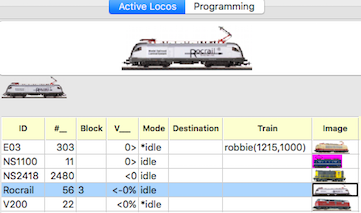 Export all or the selected locomotives into a separate XML file. Restores the state of all functions saved from the previous session. This will be activated after the first global power on. If the right checkbox is set this will be activated after each global power on. Restores the speed saved from the previous session. Use this option only if the layout controls the flow of trains instead of the automatic control of Rocrail! Show in the Loco tab; unused loco's can be set hidden to keep the list as short as possible. If a loco has this state it can not be used in automatic mode. To deactivate or to activate the automatic mode of this loco. This state is shown in the show column with a plus for activated and a minus for deactivated. Prevent starting the loco on "Start all locos". Send the decoder information to the Command Station. The Synchronise option must be activated. Creates the loco if not already exists with the name(ID), address and decoder protocol. Modifies the address and decoder protocol if the loco is known by ID. Modifies the name(ID) if the loco is known by address. Depending on the wxWidgets version the table background color will not change.